Lesson focus: Through the book of Psalms and the worship of the people of Israel, we get a glimpse into the character of God and how we should rightly respond to Him in worship. In Psalm 1 we see the distinction between the righteous and the wicked. Through this study, children will see that it’s only because of the blood of Jesus that anyone is made righteous. Take turns rolling a die and naming as many books of the Bible as the number shown on the top of the die. Older kids and adults should name books in order. Intro- – “The Name Game”- – Have kids all sit in a circle around the table or on the floor. Play a couple of different name games. have kids say their name and the name of a food or an animal or a country that starts with the same letter. Then, kids toss a bean bag around the circle saying their animal and the animal of the kid they’re tossing it to. Sing the name song using names of different kids in the group… “Micah, Micah, Bo-bicah, banana, fana, fo-ficah, me my mo-icah, micah.” The song can be sung using any name. Introduce the Psalms Study– Explain that you’re going to start working through the book of Psalms and getting to know God as He is reveled in the Psalms. Explain that each week you’ll look at a different Psalm and see what that Psalm teaches us about God and that you’ll have an opportunity to praise God based on what you see in the Psalm. Read the Text. . .Psalm 1 …. Have one of the kids in the group read Psalm 1, or have the whole group read it from a printout of the text. Discuss the Passage– After reading the Psalm, talk through the passage. Talk about the differences between “those who are blessed” and “the wicked.” Have kids tell you the things that they see in this passage that describe the differences between God’s people and other people in the world. Compare this passage to the story of the wise and foolish builders from Matthew 7:24-27. Have one of the kids read the passage for you. Help the kids see that the foundation of the rock that the wise builder built on is the truth of God. Briefly explain that a foundation is what holds a building together and helps the building to stand tall and strong. Help kids to see that God needs to be the foundation of their life. Talk about how in order to build your life on God you need to know God. Have kids name things that they know to be true about God. Cross Connection– Reread Psalm 1:5-6. Ask kids who “sinners/ wicked” are and who the “righteous” are. Read Romans 3:10-12 as a reminder that we are all sinners and we are all wicked. Remind kids that the only way to be counted as one of the righteous is through the blood of Jesus (Romans 3:22, Romans 4:5 & Romans 5:18). Make sure the kids in the group are clear that this righteous man that is referred to is not righteous because of anything He has done but only because of faith in Jesus. Prayer- Ask the kids in the group to share the truths that they see about God from this passage. Sing “Praise Him Praise Him all you little children…God is…” including the truths that they saw in Psalm 1. 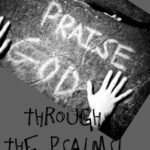 Close the prayer time by praising God for the truths that you see about Him in this Psalm and praying for the kids in the group that they would really get to know the character of God through this study. 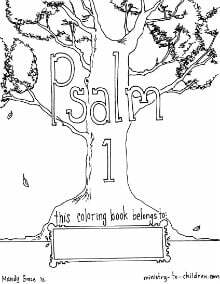 Optional Printable: Psalm One Coloring Pages – download our 8 page coloring book based on these Bible verses. Have all the kids stand up in the middle of the room. Call out a book of the Bible. If it’s in the OT they have to go to your left side and if it’s NT they have to go to your right side. To make it even more challenging, you could call out names that aren’t books of the Bible and have them freeze for those. For more teaching ideas, browse another Kids Bible lesson on Psalm 1 from our website. I’m interested in looking at all 33 lessons for our children’s curriculum, but can not seem to figure out How to find all the lessons. Only the 4 lessons showing on the front page that says “this is lesson 4 of 33………..
could you help me please find those.. Thanks for asking. The lessons are just now rolling out (a few per month beginning over the next several months) we’ll add a full index once complete. Tony Kummer (Editor) reviewed & updated this page on : March 19, 2019 at 10:16 am. All our content is peer reviewed by our readers, simply leave a comment on any post suggest an update.